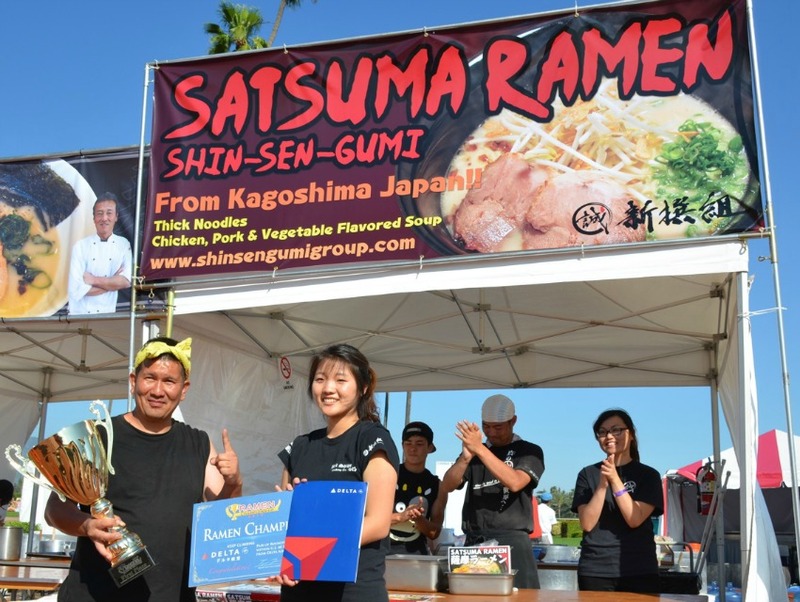 Shin-Sen-Gumi grabs first prize at Ramen Championship. 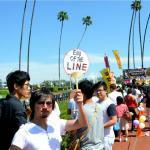 The Ramen Yokocho Association—they’re the fine group who brings the Ramen Yokocho Festival to ramen junkies all over—upped the ante this past weekend at Santa Anita Park with Ramen Championship. This event was pretty much the same as past Ramen Festivals with the addition of a contest component. 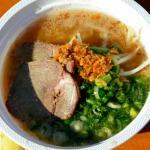 The best bowl of ramen at the Ramen Championship was decided by festival-goers and thereby crowned top ramen. Second- and third-place finishers were honored too. We are the champions of ramen! Tatsunoya used pig-head broth for tonkotsu ramen. The lines were long at Ramen Championship. Although a total of 11 ramen booths set up shop at the event, only the ones representing U.S. restaurants qualified for customers’ votes since the ramen shops from Japan tend to be wildly popular. 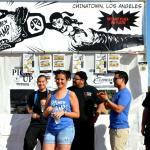 Therefore, this ramen rumble involved Shin-Sen-Gumi (L.A.), Men Oh (San Francisco), Ramen Champ (L.A.), Urban Ramen (L.A.), Kaido (Las Vegas), Kamitoku (Hawaii), and JuJuya (L.A.). Competition was ferocious under the relentless spring sun with former Chinois on Main and Spago chef Mako Tanaka of JuJuya presenting a Kyoto-style blend of shoyu and tonkotsu ramen with broad noodles. Kamitoku Ramen brought from Hawaii its “liquid ribs” broth extracted from beef and pork bones, resulting in an oxtail soup-like bowl. 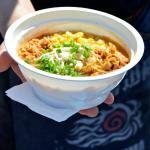 Some first-time Ramen Fest participants like Urban Ramen and Ramen Champ needed to adapt quickly to the steamy San Gabriel Valley weather while slaving over roiling pots of broth and appeasing lines of hungry ramen groupies. Alvin Cailan, Nathan Asamoto, and the Ramen Champ crew had their eyes on the prize, hoping to actualize the restaurant’s name in the form of a first-place trophy. Going with a flat, wide, curled Kitakata noodle, Ramen Champ further blinged out their bowl with pulled pork, diced back fat, and, of course, the famous Eggslut egg. When all the votes were counted, the ramen bowl to rule them all went to Shin-Sen-Gumi’s Satsuma tonkotsu ramen loaded with veggies, an exclusive bowl made only for the competition. Kounosuke Ine was the proud chef representing the ramen chain and receiving the biggest trophy plus Delta Airlines tickets. 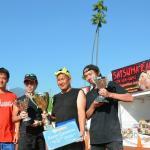 Second prize was awarded to Kaido, with third place handed to Men Oh. An outstanding bowl that was not eligible for the contest but commanded impressive lines on both days of the event was concocted by a collaboration of four Osaka ramen shops. 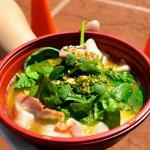 Their ramen powers united to create a tonkotsu ramen with “magic” lobster mousse and seafood broth, as well as boiled bacon strips, clumps of spinach, garlic chips, fried onion, chopped parsley, and chili pepper. 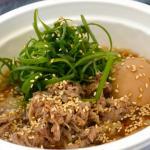 Bai tang, a chicken-broth ramen, was trending as a Japanese import and extremely popular on Saturday. 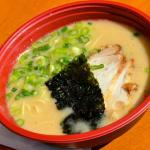 The Tatsunoya ramen shop from Kurume is home to tonkotsu-style ramen. This popular restaurant is literally heads above the rest thanks to its 20-hour pork broth created solely of porcine head bones and water. 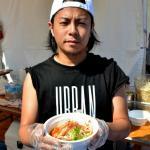 Cailan of Ramen Champ described Tatsunoya’s pig-head broth as “off the chain” good. That sharing will hopefully make L.A. an even tastier ramen town.